On May 27, 1950 Juanita married her beloved husband, William Harvey Eppard, Sr. in Washington, D.C. Together they celebrated over 57 wonderful years of marriage before his passing in 2007. She was employed as a substitute teacher for several years while she was earning her degree in education. In 1974 she earned her Bachelor’s degree in Education from the University of Maryland, University College. She went on to obtain her Master’s in Education. She taught first and second grade for over 29 dedicated years with Prince George’s County Schools at Morningside Elementary and Owens Road Elementary Schools until her retirement in1990. She and her husband enjoyed travelling with some of their favorite trips being London, Hong Kong and Hawaii. However, they loved spending time at their home on the water in Hollywood, MD. She was a prolific quilter and made many beautiful quilts for family and friends which won here many ribbons at the St. Mary’s County Fair. 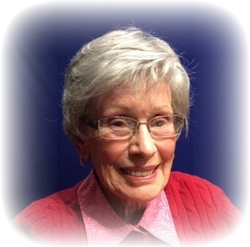 She was a longtime member of Hollywood United Methodist Church and a member of the Ladies Auxiliary. She is survived by her sons, Bruce A. Eppard (Ellen McCullough-Eppard) of Crofton, MD and William H. Eppard, Jr. (Charles Fiorentino) of Washington, DC. ; her sister Sally D. Lahn of Edinburg, VA, three grandsons: Brian Eppard of Chesapeake Beach, MD; Jonathan Eppard of Chesapeake Beach, MD and Michael McCullough of Crofton, MD; and her great-granddaughter, Taylor Eppard of Crofton, MD; and many extended family and friends.. She was preceded in death by her parents and husband. A Memorial Service will be celebrated by Pastor Katie Paul on Saturday, November 10, 2018 at 1:00 p.m. at Hollywood United Methodist Church, 24422 Mervell Dean Road, Hollywood, MD 20636. Private Interment will be held at a later date. Memorial Contributions may be made to Hollywood United Methodist Church Building Fund, 24422 Mervell Dean Road, Hollywood, MD 20636 and Hospice of St Mary’s County, P.O. Box 625, Leonardtown, MD 20650. Arrangements are being provided by Brinsfield Funeral Home in Leonardtown, Md.